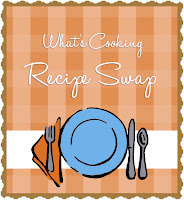 It's Recipe Swap time again! Breakfast was the theme of this Taste of Home Cooking recipe swap. I submitted my Banana Stuffed French Toast recipe, and was given a recipe for Greek Scramble with Lemony Hollandaise Sauce from the Ashley, the author of the blog Cheese Curd in Paradise. I was intrigued by the hollandaise sauce because I have had it - love it with steak or asparagus - but I have never made it. Ashley made a quick hollandaise sauce when she made this recipe since she didn't have time to make it the traditional way. Since I have never made this sauce before, I did some reading on how to make it the traditional way and added a few steps to Ashley's quick recipe (this still isn't the completely traditional method of using a double boiler and clarified butter, but it was good for my first time). My friend Jenny was here and she actually did the stirring for me since I was taking care of the eggs, bacon, and potato pancakes all at the same time! But it did look very easy - you just need to stay on top of it so your eggs don't start to scramble! 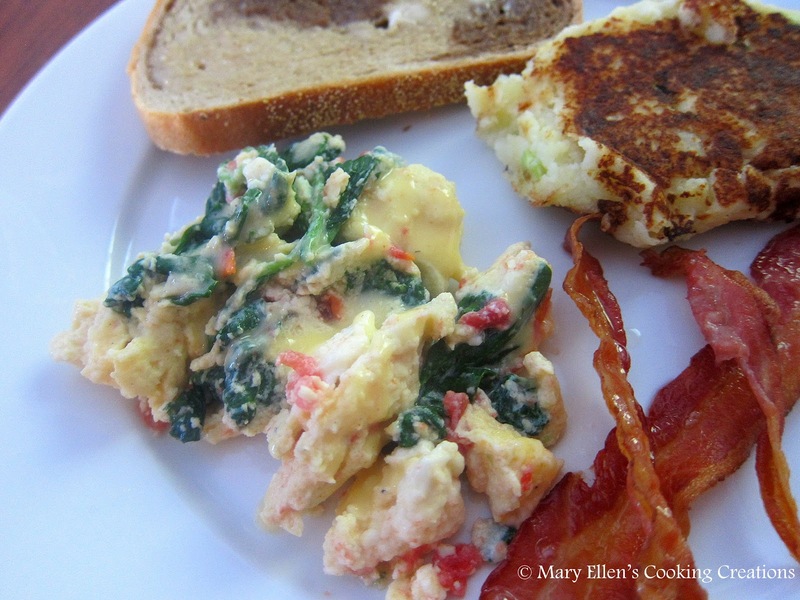 I love spinach and tomatoes in an omelet - that's what I always order when we go out for breakfast - so I loved the scrambled part of this recipe. The hollandaise sauce was good, and I'd make it again to serve with steak or veggies, but not with eggs. Just a personal preference, that's all! Thanks for a great recipe, Ashley! Heat 1 tbsp butter in a pan over very low heat (I used the lowest setting on my precise simmer burner). Beat the egg yolks and mix in the lemon juice and cayenne. Add the egg yolk mixture to the pan and gently stir until bubbles form around the edge of the pan. Keep stirring, adding 1 tbsp of butter at a time until all of the butter has been used. Serve over the eggs immediately. In a medium bowl beat eggs with milk, salt and pepper. Saute spinach till wilted and add tomatoes. Add eggs and pull in sides till as they set. Before the eggs are finished, stir in the feta cheese. Finish scrambling the eggs. Plate and top with hollandaise sauce and a little extra feta.